A few months ago, astronomers noticed that a well-known asteroid that orbits the sun way out past Mars had sprouted a long, comet-like tail. Now, data from the Hubble Telescope reveals that something has set 6478 Gault off kilter and it’s self-destructing, spinning itself into pieces. 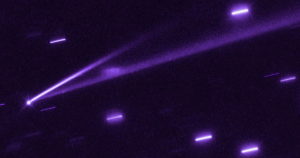 Scientists from NASA and the European Space Agency (ESA) suspect that Gault has fallen victim to the YORP effect, in which sunlight hitting the asteroid heats its surface, causing a shift in the asteroid’s momentum. Sometimes, as the astronomers suspect is the case with Gault, this momentum can speed up the asteroid’s spin to the point that it begins to disintegrate. The long tail that appeared in January could be debris given off by a series of landslide as Gault began to spin faster. While NASA and ESA scientists approximate that roughly one of the 800,000 asteroids orbiting between Mars and Jupiter goes through a so-called YORP disruption every year, being able to directly study the materials that Gault shreds off of itself could help astronomers better understand the history of our solar system. But the YORP effect may not spell doom for Gault. Insider reports that it’s certainly possible that 6478 Gault could disintegrate into nothing. But it’s also possible that the asteroid’s gravitational pull will manage to hold enough debris together that a new version of Gault is reborn. The post Astronomers Just Spotted an Asteroid Ripping Itself Apart appeared first on Futurism.